An election-law expert says changes at the U.S. Postal Service may be a key reason hundreds of absentee ballots submitted across Virginia will not count — including 55 ballots in tight races in Stafford County. WASHINGTON — Changes at the U.S. Postal Service may be a key reason hundreds of absentee ballots submitted across Virginia will not count — including 55 ballots in tight races in Stafford County. Former Virginia Board of Elections Secretary Don Palmer, now a fellow with the Bipartisan Policy Center focused on election improvements, said changes that added two days to standard processing times for First Class mail, among other things, have made it less likely that even ballots mailed the Friday before an election arrive in time to be counted. In Virginia, only ballots received before polls close can be counted under current law; the postmark does not matter. “There’s less [service] over the weekend for postal processing, and so the voter needs to be aware that it’s going to take longer for their absentee ballot … to get to an election office,” Palmer said in an interview. “This was all sort of due to cost savings, and so it’s been going on for a number of election cycles, but, for example, the [reductions in] processing over the weekend is something that’s fairly new, and it added another wrinkle,” he said. The USPS delivery standards changed early last year so that First Class delivery went from 1-3 days to 2-5 days and Standard delivery is now 2-9 days. Please take this into consideration as you start thinking about absentee voting. Even though the Postal Service changed standard processing times, Virginia law has not changed the deadline to request an absentee ballot from the Tuesday before Election Day, which creates a tight, if not impossible, turnaround to get a ballot, vote and return it in time. “It is sort of misleading to the voter if there’s such a late deadline, there’s a false sense of reliability that this ballot’s going to get back when there’s a good chance it might not,” Palmer said. He was appointed to the State Board of Elections in 2011 by Gov. Bob McDonnell, serving through mid-2014, after running earlier elections in Florida. “The bottom line is that you need to get it in a little bit earlier than you had … needed to in the past if you’re going to vote by mail, and that just means you need to plan for it; you need to request your ballot earlier, get it, vote it, and then send it back with plenty of time to spare,” he added. He suggested lawmakers in Richmond consider moving the deadline to request a mail-in absentee ballot farther away from Election Day, and would also like the Postal Service to do more weekend mail processing of elections materials. “The Postal Service should really look at making an exception for election mail. It isn’t like every weekend in this country that we have elections …. That would obviously help with some of the issues of ballots not making it in time for elections,” Palmer said. Still, an email sent by Stafford County Registrar Greg Riddlemoser to state elections officials the day after the election expressed significant frustration that the 55 late-arriving absentee ballots were not delivered on time. His office had called the Postal Service every hour or so after a 2:30 p.m. mail delivery to check for any additional ballots. Only one more ballot was hand delivered from the Richmond mail processing center around 6 p.m., Riddlemoser said. At 10 a.m. the next day, 55 absentee ballots had arrived — too late to be counted. “There is no possible way in my military mind that these ballots should not have been available to us on Election Day before close-of-polls. How can there be zero, zero, zero — all afternoon and evening and then suddenly 55? We have a [Board of Supervisors] race with a tiny delta. We have a [House of Delegates] race with a very small delta. Maybe 55 would have swung one or both?” Riddlemoser wrote in the email. Since the ballots remain sealed, it is not clear whether any or all are from the Garrisonville District or the 28th house of delegates District. Each race is expected to go to a recount after the State Board of Elections certifies results Monday. A federal lawsuit filed on behalf of Democratic candidate Joshua Cole aims to delay the certification to potentially get those ballots counted. Cole trails Republican Bob Thomas by 82 votes in their race to replace retiring House Speaker Bill Howell. While the 55 ballots in Stafford have generated significant attention, hundreds of others also arrived late across the commonwealth. In Fairfax County, Registrar Cameron Sasnett received 158 absentee ballots on Wednesday, Nov. 8, and 365 on Thursday, Nov. 9. In response to a request for comment from WTOP, a Postal Service spokeswoman pointed to a series of online materials for elections officials that outline general policies for election mail, including a recommendation that local officials regularly check in with their local post office coordinator for deliveries on Election Day. A separate inspector general’s report released this summer suggested the Postal Service underreported late-arriving mail by about than 2 billion pieces in the 12 months beginning in March 2016, which the report said affected the Postal Service’s ability to meet its mail service commitments. The Postal Service does partner on efforts to offer bar code tracking of absentee ballots. Palmer said that has not always worked perfectly in the parts of Virginia that have tried it, but it could increase confidence in the system. 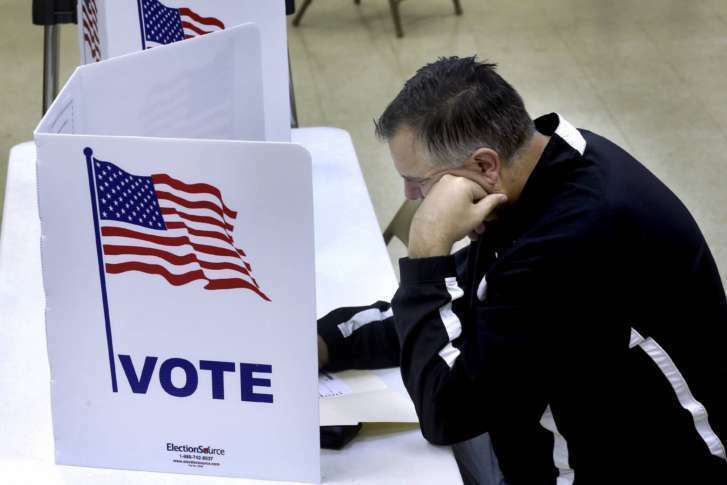 “It allows the voter to track their ballot — and this has been significant for overseas military voters particularly — they’re able to track where their ballot is being processed and when it was processed by the Postal Service, and it also informs them when the ballot was delivered, so this is a good tool for voters to know that ‘Yes, my ballot actually made it’ or ‘It looks like it may not make it in time.’ It also gives the election office the ability to track that ballot,” Palmer said. Voters casting absentee ballots in the future need to be more aware of the Postal Service policies, he suggested. “There has to be an informational campaign that the mail service is just going to take a little bit longer than it used to in the past, and that you’ve got to give yourself time to get that ballot back. You cannot wait until the last minute, otherwise there’s a good chance that your ballot won’t make it in time and it won’t be counted, Palmer said. “The State Board of Elections and the political parties have a responsibility to try to inform folks that want to vote by mail that they need to give themselves additional time, and the legislature should look at making the absentee ballot request, pushing it back a little so folks have additional time to get their ballot and return,” he said.